At more than twice the length of the North American river otter, the giant river otter (Pteronura brasiliensis) is quite a sight. A skilled hunter and apex predator, the giant river otter is also very much a family-oriented creature, living in large and often noisy groups along the river banks of the Amazon and its tributaries. Sadly, however, the very existence of this marvelous mammal is under threat, and its population continues to dwindle. How big do giant river otters get? Giant otters can reach up to 6 feet (1.8 meters) long, making them the longest members of the Mustelidae, or weasel family, to which they belong. Early documentation of skins and live animals suggest that they once grew up to 7.9 feet in length (2.4 m), but such large specimens ceased to exist when the giant otter population began to decline. A fully-grown adult male typically weighs between 57 and 71 pounds (26 and 32 kg). Most giant river otters have chocolate brown fur, with some having a slightly reddish hue. The velvety fur is short but incredibly dense, preventing much water from reaching the skin. Every otter has a uniquely shaped patch or pattern of white fur along its throat. These markings allow otters to identify one another. When two otters meet, they typically engage in an act known as periscoping, in which each otter raises its throat and chest above the water so that it can be recognized by the other. Like other otters, giant otters have various adaptations suited to their aquatic environment. Their powerful tails, webbed feet and long, flexible bodies help to propel them through the water, and their nostrils and ears close while swimming to keep the water out. Giant otters are highly sociable but aggressively territorial. They live in extended family groups of up to 20 individuals, which typically include monogamous parents and their offspring from several breeding seasons. They make their dens by burrowing into the riverbank, after which they establish a home territory that they will defend aggressively if need be. And if you’re anywhere near a group of giant otters, you’ll probably hear them before you see them. They are the noisiest of all otters, with a range of vocalizations that researchers have categorized into as many as 22 distinct sounds. These range from barks to hums to wavering screams, and may be used as warnings, reassurances or simply as a way to gain some attention within the group. Giant otters are apex predators, sitting at the top of the food chain. Fish form the bulk of their diet, but they’ll supplement this with snakes, crustaceans and other river creatures. Giant otters are excellent hunters. They hunt alone or sometimes in groups, using coordinated efforts to catch enough to keep the group fed. An adult will normally eat six to nine pounds of food per day. Being an apex predator, the giant otter has no known natural predators, at least none that are common. There are accounts of caiman preying on giant river otters in the Amazon and the Brazilian Pantanal (a tropical wetland where giant river otters are also found). Jaguars and anacondas might also prey upon young and vulnerable otters, but such attacks are rare. Unfortunately, this has become the most pressing question regarding the giant river otter. The total population of giant river otters in the wild could now be as low as 5,000. The IUCN Red List classifies the giant river otter as endangered, with its population still decreasing. The threats they face are numerous, and include habitat destruction, hunting for pelts, and conflict with fisherman, who often see the otter as a nuisance. 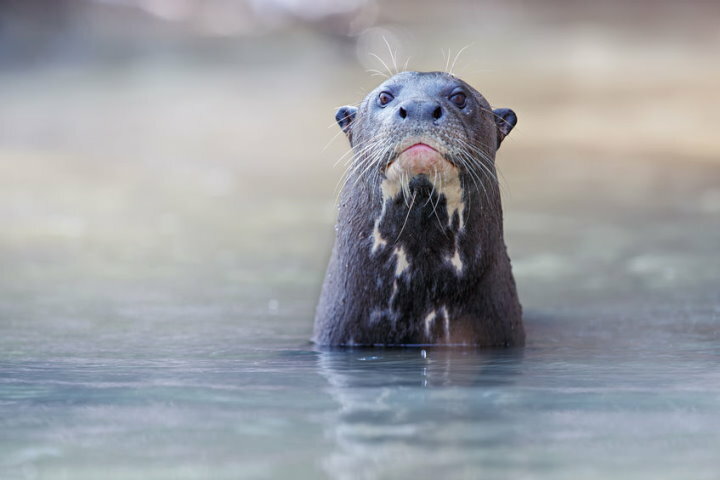 Despite conservation efforts in various parts of the Amazon and the Pantanal, the future of the giant river otter remains in the balance. Where can you see giant river otters in the wild? Giant river otters live in and along the Amazon River and its tributaries, as well as in the Orinoco River in Venezuela. They’re also found in the Brazilian Pantanal, the world’s largest tropical wetland area. Due to their dwindling numbers, it’s not always easy to see them, even during a multi-day wildlife-spotting trip in the Amazon or Pantanal. One of the hotspots for seeing these otters in the Amazon is Tambopata National Reserve in the Madre de Dios region of Peru. The rivers and oxbow lakes in the reserve, in particular Lake Sandoval, are famous for their giant river otter communities. A lesser-known location in Peru for seeing giant river otters is the Pacaya-Samiria National Reserve, located between Tarapoto and Iquitos.